And we're done. 18 episodes in the space of 22 days. It's been stressful trying to be social and living life while also doing these and sorting myself out medically, but I can honestly say these latest episodes have produced some of my finest work... except the episodes that gave me little to talk about. 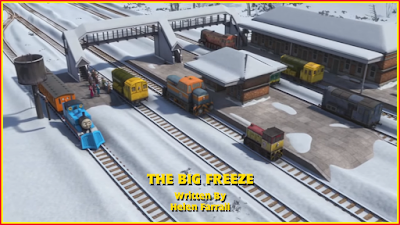 But will The Big Freeze leave the series on a high note before its months long hiatus? Not really. But it's not exactly a bad episode either. It's simply... fine. I love the fact the snow and ice has an actual impact on the engines and the railway. So many episodes in the past have only had snow in them as it's the only way for set designers to differentiate between wintry episodes and others (although this hasn't been as much of an issue in recent years). But with frozen points, icy rails and delayed deliveries, this episode was the one that comprehensibly showed off what can happen in wintry weather. The characters were also great, but that's no surprise since we're talking about an episode written by Helen Farrall. Diesel was a real highlight for me. It's obvious that he's still trying to help and make friends, but he's still doing it in his own way, which is great. Also, I thought his interactions with Annie and Clarabel were fantastic. They felt akin to Thomas and the Evil/Naughty (because Americans probably thought "evil" was too strong of a word. Which, considering the series couldn't say "shut up" after the market expanded to the US, wouldn't surprise me) Diesel, and it would be rather interesting if we saw them together again in the future. The themes were... fine. Thomas' lesson of listening to orders and advice was good and well handled, while Diesel's (heroes can come from unexpected places) was really nice too. They don't do anything new, but they're well done. The emphasis on diesels, however, was great. With (possibly all) the steam engines going around the world next year, it could be a chance for the diesels to do more on Sodor (if Sodor even gets any focus). And if this was a first step of heading in that direction, then I'm on board. Although I will say that not bringing BoCo back was a missed opportunity. I'm not one of these fans who spend so much time and effort begging for his return because... well, they've nothing better to do (except "joke" that a character is dead. Then post said "joke" on an official source of franchise information because screw your reputation, the target audience and important context that makes a joke funny). But his ability to scold characters when they've done something wrong would have made Thomas feel even worse. That said, it would have run the risk of hammering the message in further. What BoCo would have offered though (undeniably) is size. This episode pointed out a problem that's been bubbling since... series 6, actually. There simply is not enough large diesels in the show nowadays. Fans say Bear and BoCo are pointless characters, but the size and muscle they offer would be ideal should this situation happen again. Because let's be honest here: seeing three shunters triple head the Express - the fastest train on Sodor - is a bit ridiculous. Especially if they can be put to work elsewhere. Also, does anyone else find it odd that the diesels had no problems with the icy conditions? It feels like yet another example of making certain characters look bad to make others look good (Three Steam Engines Gruff being the most egregious example. And I've a bad feeling that, with the main cast becoming more diverse from next series, this problem may end up surfacing again. Only much more prominently and a heck of a lot worse). Maybe if they were shown to be struggling as much as the steam engines were, this could have been handled better. Also, the Fat Controller's antics are now more groan worthy than funny. It's been the exact same joke with him for just the last two episodes, and it's gotten really old with its overuse. Add more variety in the future! Or add a comic relief and let the Fat Controller do his job. It says a lot when he felt more like a manager in series 8-16 - oft cited as the worst era of the show - than he does now with writers who actually know what they're doing. Well, this was a tough review to get done. I'm not sure whether it's down to the reactions to the new information about where the show's heading sucking the life out of me, writer's block or the pure exhaustion of writing eighteen of these things while still worrying about medical problems and my social life. But this was an incredibly tough one to get through as I had so little motivation and only wanted to get it done so it could be released before I went under the knife. Rest assured that, despite the struggle, I'd feel the same way about this episode regardless. It's just been harder to get those thoughts down in a blog post. Overall, I don't think this is Helen's strongest episode. But there's not really much to dislike either. It's great that they showcased the diesels a bit more. The other characters were great and the theme was... alright. However, the Fat Controller's humour has really gotten old now. It probably won't be cut at this point, but at least make it interesting and varied. Big World! Big Adventures! Big Problems.